If you sat quietly in our living room you could be forgiven for thinking that we’ve got a fairly serious plumbing issue. From all corners of the room comes a steady chorus of dripping, punctuated with the odd bubble. There’s nothing wrong with the plumbing but Big Dreamer has been busy home brewing. On various shelves and in several cupboards there are bottles and buckets gently fermenting their way to readiness. His first attempt at a beer made from hops necessitated the purchase of the biggest pan I have ever seen. Little Owl was delighted with the box it came in and adopted it as a rocket. She has spent hours decorating it and has even slept in it. She insists on being blasted off upstairs come bedtime. Finch edges eagerly around the rocket box while deep inside Little Owl keeps watch for any incursions using her periscope. Finch has finally got the hang of walking. He has the stance of a cowboy and tucks his thumbs under his armpits, his elbows out at right angles as if he were about to do the hornpipe. He is no match for Little Owl however. No matter how hopeful his beaming smile he will never know the wonders of the inside of the rocket box; he’s far to easy to overbalance. Just wait Little Owl, I say, just wait! 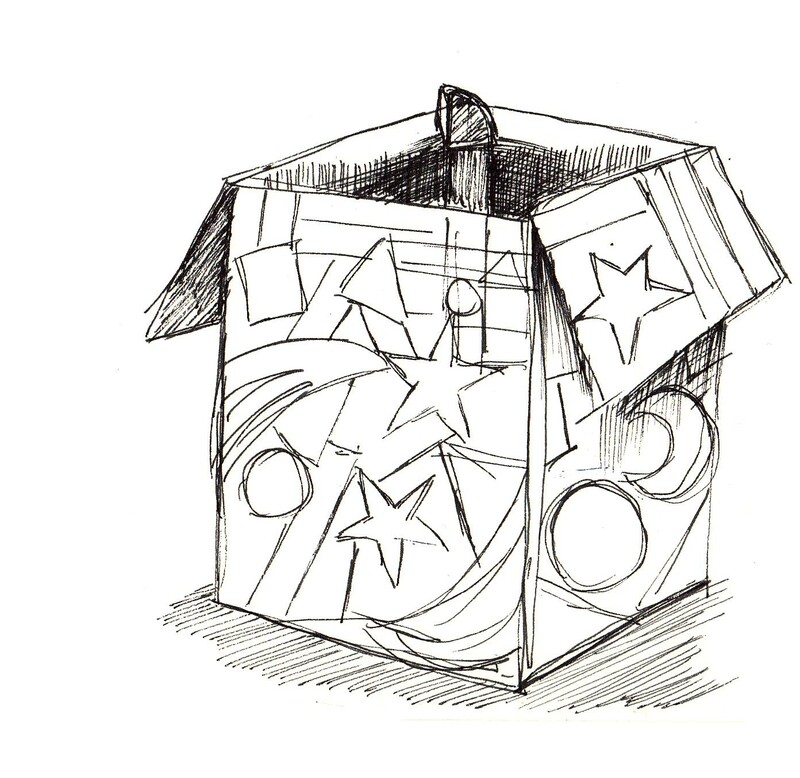 This entry was posted in Family and friends, Illustration and tagged beer, box, children, fermenting, home brew, hops, illustration, parenting, periscope, plumbing, rocket, sketch, sketchbook. Bookmark the permalink.